The Perfect Royal Icing is finally yours. For those of you who bake and ice cookies throughout the year or bake and ice festive cakes with highly decorative work, having a good, reliable royal icing is absolutely essential. Everyone wants their royal icing to pipe well, flow beautifully and finish off with a smooth surface. Moreover, the perfect royal icing has to taste as good as it looks and it has to be easy to remember so that one can whip a batch at a moment's notice. Over the years I have tried many recipes from various sources, but not until now have I actually approached coming up with one of my own. What I did was what any responsible recipe developer normally does. They study sources and then experiment in the kitchen until the recipe is to his or her specifications and perfect. In my pursuit of the perfect royal icing I turned to those trusted sources from my personal cookbook library, remembering which recipes I had tried and loved. Bo Friberg’s ‘The Professional Pastry Chef’, The Culinary Institute’s ‘Baking at Home’, Le Cordon Bleu’s ‘Professional Baking 3rd Edition’, Larousse Gastronomique, Anne Willan’s ‘La Varenne Pratique’, Lisa Yockelson’s ‘Baking by Flavor’, Nancy Baggett’s ‘The All-American Cookie Book’ and Martha Stewart’s ‘Baking Handbook’, were the books I pulled out to compare. I made many mental notes on proportions, preparation and tips from each and every one of these individuals, calling to mind what qualities I liked best from previous experiences. 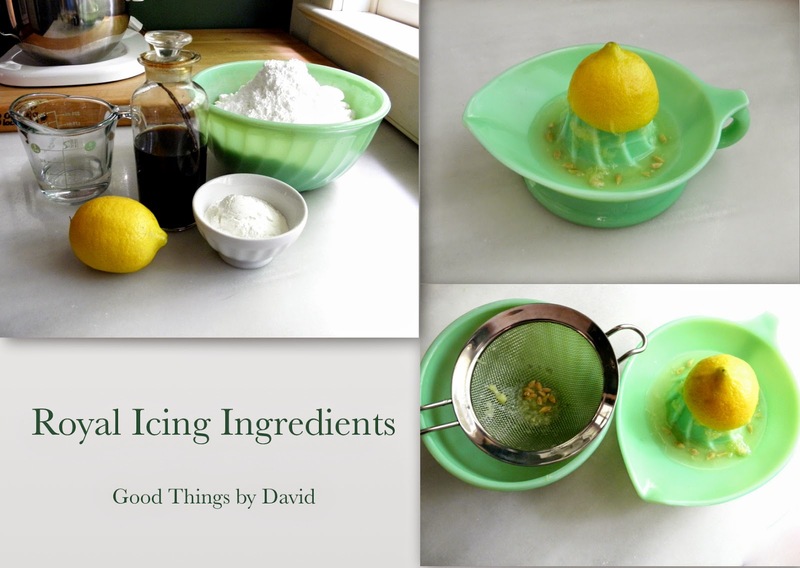 From the sifting of the confectioners sugar and the use of lemon juice as a stabilizing & flavoring agent, to the beating of the icing on a particular speed for an exact amount of time and observing the texture of the finished icing, I narrowed it down and paid attention to everything. It was my goal to make it easy for all of you to achieve perfect results at home. The recipe is now yours. Note: the recipe can be scaled down in half or multiplied depending on the amount needed. In the bowl of a stand mixer fitted with the paddle attachment, add all of the ingredients and mix on low speed for 30 seconds to 1 minute. Let the ingredients come together. Stop and scrape the icing from the paddle and bowl. Raise the speed to medium and beat the icing for exactly 2 minutes. Set a timer. Stop the machine and observe the icing. It should be smooth and glossy. The icing is now ready to be used. Divide among bowls to tint with food coloring or store it in a glass or stainless steel bowl. I don’t advocate storing royal icing in plastic containers as these are difficult to keep grease-free, which may cause the icing to separate. If you’re not ready to proceed icing cookies, place a piece of plastic wrap directly onto the surface of the icing. Royal icing dries out quickly. 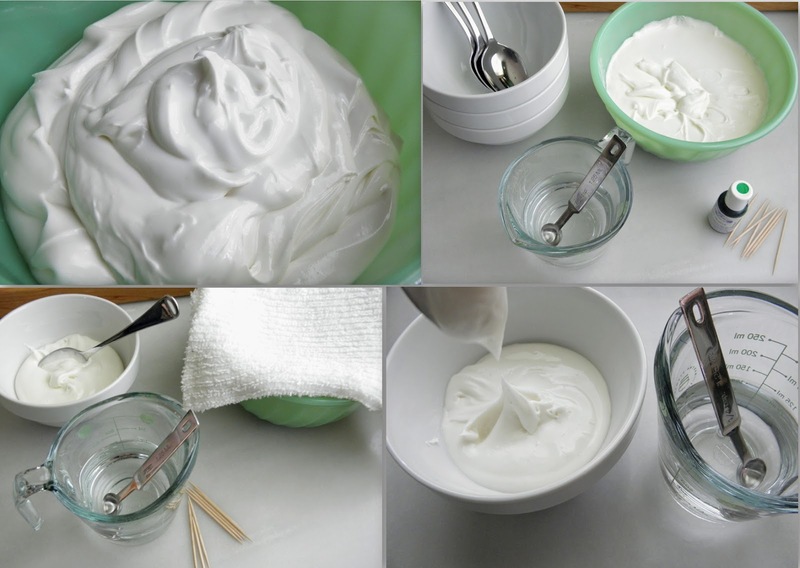 Note: Icing can be stored at room temperature since it is made with meringue powder, but it can also be refrigerated. Store icing for up to 5 days. Mix well with a spatula before using. The photo above (A) shows you how not to cover royal icing for storage. 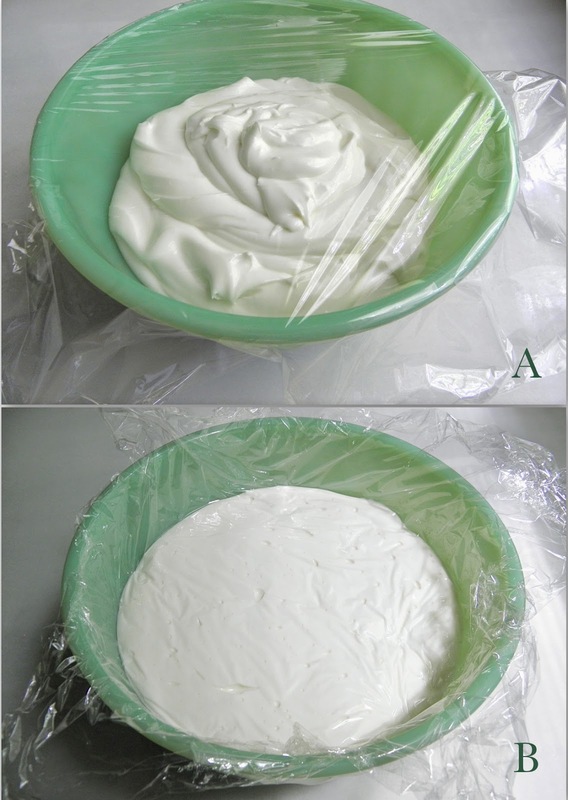 Plastic wrap has to be placed directly onto the surface of the icing (B) in order to keep it from drying out. Stiff Royal Icing is what you have when the mixer stops. At this point you can use the icing to pipe filigree, lace work or script onto a cake (think weddings) or cookie. A stiff peak will remain if you lift a bit of it with a spoon or spatula. If you still think it isn't stiff enough, add more confectioners sugar by the tablespoon until you have a very stiff icing. You can make your own custom-colored sweet toppings for cakes, cookies and cupcakes if you pipe out shapes onto a parchment-lined or wax paper-lined baking sheet. Let the shapes dry completely before using them. Flooding Cookies with royal icing requires the right consistency in order to achieve good results. You will need to thin out the icing when it comes off the mixer for this purpose. Using a 1/4 teaspoon measuring spoon, add water bit by bit and mix to combine. Either do this to the entire batch of icing or to each portion of icing to be tinted. Only add 1/4 teaspoon of water at a time before checking to see if it needs more. 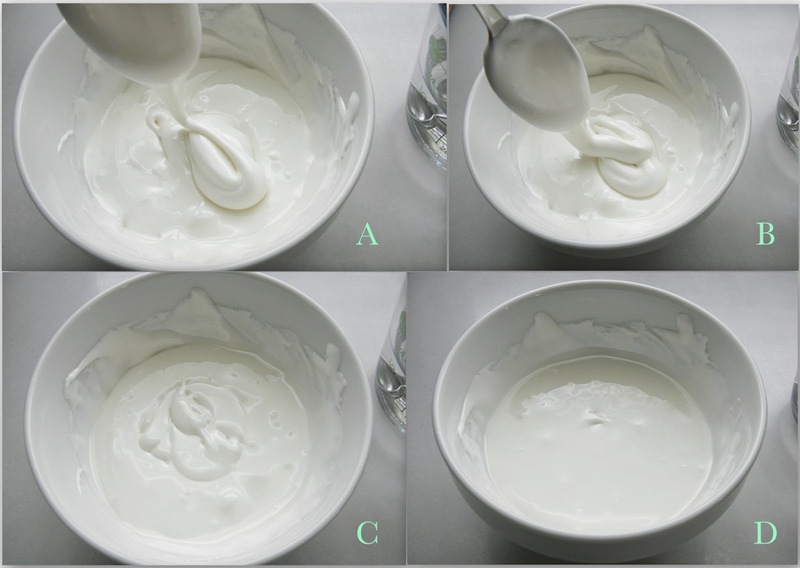 A & B ~ When you lift a spoon of icing and let it fall back into the bowl, it drops like a thick ribbon. C ~ After about 15 seconds, the ribbon will begin to dissolve back into the icing. D ~ At 1 minute, the surface of the icing will be smoothed out. This is what you want your icing to be like if you're going to pipe and flood cookies just like you've seen me do here on Good Things by David. If the icing has thinned out more than it should, add confectioners sugar to bring it back to the right consistency. Runny Icing is perfect for using as a glaze on cookies. This is perhaps the easiest thing to achieve, because it only requires you to thin out the royal icing with water until you have a drippy consistency. 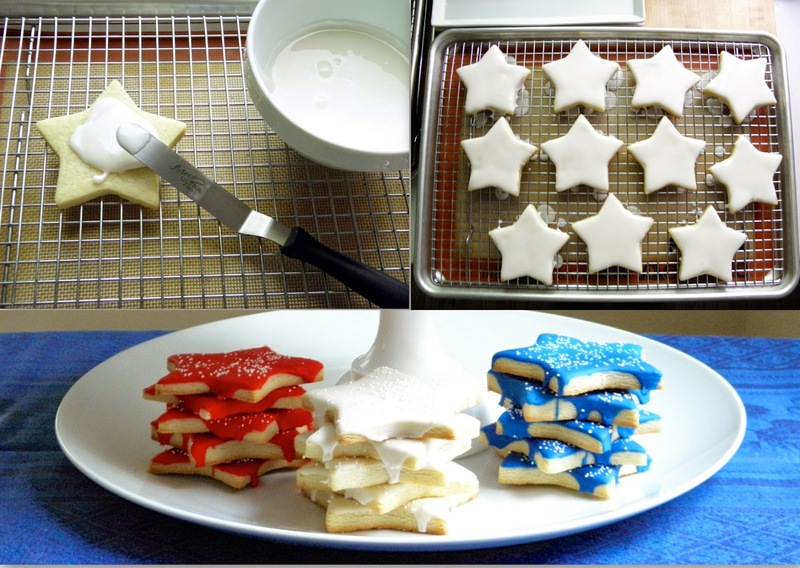 Those Patriotic Star Cookies were created with thinned out royal icing. The proof of the pudding is in the eating. If I'm lucky, I get to keep a cookie or two to enjoy. Gather the simple ingredients from your pantry and make some royal icing for those beautifully-shaped cookies that I know many of you make. Tint bowl after bowl of portioned icing to make your favorite colors and let the fun begin. A bit of imagination, some whimsical artistry and a steady hand is all you need now to create beautiful cookies. You're going to love working with this icing.